Striving to capture the beauty and simplicity of the form, looking at the shape and line the body takes. Lesley Shaw is an artist and printmaker working primarily in charcoal, pen and ink and traditional printmaking techniques such as linocut, mono and drypoint. Life drawings form the basis of all her work. She works quickly and instinctively to capture the beauty and simplicity of the form, looking at the shape and line the body takes. Figurative and animals feature in bold, striking images and simplistic, illustrative line drawings. 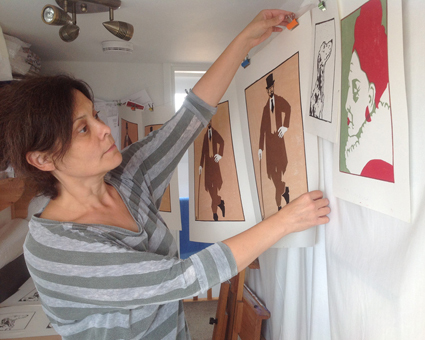 Lautrec and Schiele continue to inspire Lesley, as do the iconic late 19th century theatre posters. Lesley is now based in York, having lived and worked in London for more than 20 years. Since completing a BA (Hons) in Illustration, she continues to produce art for both exhibition and private sale. Lesley has sold work at the Mall Galleries London, to the BBC, Manya Igel Fine Arts and was recently shortlisted for the Royal Academy Summer Exhibition. Lesley is a member or York Printmakers and the York Art Workers Association. She works from Pica Studios in York, set within an 18th century print works, now housing the workshops of around 20 artists, makers, writers and musicians.